It’s time for a shootout in space against those pesky alien invaders who are intent on taking over – but rather than a high score listing as an achievement the Space Invaders slot machine sees you earn hard cash for your services to mankind! It is unlike your typical 5-reeled slot machine as it sees you battle against the aliens on screen with original sounds from the arcade game ringing out as you do so. This slot version by Fremantle is of course based on the worldwide hit arcade game which was developed by Taito and first released in 1978 with the task being to defeat waves of aliens with a laser cannon to accumulate the highest score possible – straightforward but very addictive! The stakes are very generous as you get to select the number of paylines you’d like to activate with 5, 10, 15, 20, 25, 30, 35, and 40 all available, and as we always recommend players on how to play online slots, the maximum of 40 should be chosen – which will cost you more but provide you with an increased chance of winning. 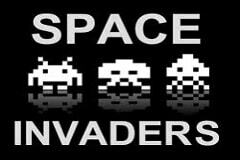 Coin values range from 1p to £5 and with between 1 and 5 coins allowed to be bet each payline this means you can play the Space Invaders slot in real money mode from 40p up to £200 per stake. In true retro style, all of the symbols that feature in Fremantle’s Space Invaders slot machine are pixelated and hark back to the good old days of 2D arcade games. While it may appear to be outdated and lacking the 3D graphics we have become used to, preference will probably come down to which era you were born in – with those of you who enjoyed the Space Invaders machine in pubs likely to be enthralled by the gameplay and the younger generation amongst you likely to be left underwhelmed. The main symbol to watch out for is the Wild Invader which has the ability to substitute to make a winning combination for all but the special symbols which are the Mystery Ship Scatter and the Bonus Cannon – more on these and their features later. There is also the Space Invaders logo which is instantly recognisable, a bunker and the lowest valued of all – Ace to Jack playing card symbols which have been designed in a space style. This second screen bonus game activates once you land the Mystery Ship symbol anywhere on the reels and you’ll then have to put your shooting skills to the test as you are tasked with firing a cannon (simply by using your mouse) to down a ship that appears on screen – before it wipes you out. Once you do this the total number of free spins that you’ve won will be assigned along with a multiplier bonus. This is pretty easy but also quite enjoyable and different from the typical free spins modes we see so often, but it does have a flaw too. The free spins mode cannot be retriggered as they play out as the Mystery Ship and Bonus Cannon symbols are removed from the reel set until your spins play out – but more often than not the wins achieved certainly make up for this – if you’re a dab hand at shooting that is! The other bonus feature in Space Invaders requires the Bonus Cannon symbol with you having to accumulate five of them in total to proceed onto the bonus game where big wins can be enjoyed. Each time you land Bonus Cannon symbol you’ll notice that the counter increases at the top right hand side of the screen – so no counting in your head is required and you can dream off into space instead. It’s shooting time once more as you take control of the cannon with your mouse and fire at the aliens attempting to invade – with each shot that lands seeing you receive a win or an Alert. A win boosts your winnings while an Alert sees one of your five lives decreased – with the bonus game continuing until all of your lives are gone just like the actual game – nifty indeed! The Space Invaders slot machine from Fremantle can’t be compared to other real money online slot machines as the design and structure is completely unique, in keeping with the classic arcade game. The pixelated graphics see a crossover of a classic 2D game with real money slots in a combination that promises big wins thanks to the two exciting bonus features where you take control to wipe the aliens by yourself!